Alta Supply Inc. (“Alta Supply”), a wholly-owned subsidiary of CannaRoyalty, generated revenue of ~US$840,000 in April, 2018(1), representing its highest monthly revenue to date. Both Alta Supply and RVR contribute to California’s economy and job market. Year-to-date to the end of April, 2018, Alta Supply has collected and remitted ~US$530,000 in excise taxes to the state of California; RVR has collected and remitted ~US$1.3 million during the same period. Together, Alta Supply and RVR have 75 employees in California. OTTAWA, May 4, 2018 /PRNewswire/ – CannaRoyalty Corp. (CSE: CRZ) (OTCQX: CNNRF) (“CannaRoyalty” or the “Company”), a leading North American cannabis products and brands company, announced today that its wholly-owned California-based distribution subsidiary, Alta Supply, generated record monthly revenue of ~US$840,000 in the month of April, 2018. The number of licensed dispensaries in California decreased from December 2017 to January 2018 as enhanced state-wide regulation was implemented concurrent with the transition to a full recreational adult-use market. As a result, fewer licensed dispensaries exist in the state today than in December 2017. This is a short-term phenomenon as operators work towards compliance. Because of this rapid market reset from December 2017 to January 2018 Alta Supply and RVR experienced a year-over-year decline in revenue at the beginning of 2018 along with their peers. However, as the April revenue figures reported today demonstrate, both companies have steadily and powerfully grown revenue even over a lower dispensary base. California transitioned to a full recreational adult-use market in January 2018 and retail sales are forecast to grow to US$5.2 billion in 2018. (4) CannaRoyalty identified early-on that distribution would be an increasingly important part of the value chain. In March 2018, the Company announced it had closed the acquisition of Alta Supply and entered into a binding term sheet for the acquisition of 100% of RVR and its affiliates. Together, Alta Supply and RVR collected and remitted US$1.83 million in excise tax to the state of California from January 2018 to April 2018, making them large contributors to the state economy. As the Company’s acquisition of RVR has not yet closed, the Company has relied on RVR as a third party to provide this revenue information. CannaRoyalty is an active operator and investor in the global cannabis industry, with a strong focus on California, the world’s largest cannabis market. Our core mission is to become the leading global consumer product goods company for discerning cannabis consumers. We are currently focused on building a diversified portfolio of manufacturing, distribution, intellectual property, and infrastructure assets to achieve this goal. Our leadership team combines a passion and hands-on understanding of the cannabis industry, with seasoned financial and legal expertise. 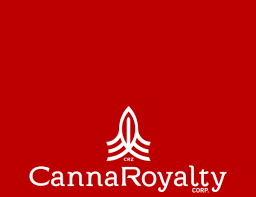 CannaRoyalty’s shares trade on the Canadian Stock Exchange (CSE) under the symbol CRZ and internationally on the OTCQX under the symbol CNNRF. Forward-looking statements may include, without limitation, statements relating to the timing for the Company’s acquisition of RVR, sales forecasts and anticipated growth for the California cannabis market, execution of the Company’s strategy, new opportunities, future growth and other statements, and, while the Company’s board of directors/audit committee has reviewed the financial information provided in this document, statements relating to financial information for Alta Supply and RVR are for a period which interim financial statements have not yet been prepared by the Company. Forward‐looking statements involve known and unknown risks, uncertainties and other factors which may cause the actual results, performance or achievements of CannaRoyalty, its subsidiaries, or its affiliates to be materially different from any future results, performance or achievements expressed or implied by the forward‐looking statements. Although CannaRoyalty has attempted to identify important factors that could cause actual results, performance or achievements to differ materially from those contained in the forward-looking statements, there can be other factors and assumptions that cause results, performance or achievements not to be as anticipated, estimated or intended, including, but not limited to: the monthly revenues for Alta Supply and RVR may not be sustained on a going forward basis and may be subject to adjustment prior to completion of the interim financial statements of the Company for the period ended June 30, 2018, undue delays with respect to the closing of the RVR acquisition, effects of general economic conditions, changing foreign exchange rates and actions by government authorities, uncertainties associated with negotiations and misjudgments in the course of preparing forward-looking information, dependence on obtaining regulatory approvals, investing in target companies or projects that are engaged in activities currently considered illegal under US federal law, changes in laws, limited operating history, reliance on management, requirements for additional financing, competition, hindering market growth and state adoption due to inconsistent public opinion and perception of the medical-use and adult-use marijuana industry, and regulatory or political change.